The headline news is that this Tuesday in Fortaleza, northeast Brazil, the BRICS group of emerging powers (Brazil, Russia, India, China, South Africa) fights the (Neoliberal) World (Dis)Order via a new development bank and a reserve fund set up to offset financial crises. The devil, of course, is in the details of how they’ll do it. The BRICS Development Bank – with an initial US$50 billion in capital – will be not only BRICS-oriented, but invest in infrastructure projects and sustainable development on a global scale. The model is the Brazilian BNDES, which supports Brazilian companies investing across Latin America. In a few years, it will reach a financing capacity of up to $350 billion. With extra funding especially from Beijing and Moscow, the new institution could leave the World Bank in the dust. Compare access to real capital savings to the Fed printed green paper with no collateral. Way beyond economy and finance, this is essentially about geopolitics – as in emerging powers offering an alternative to the failed Washington consensus. Or, as consensus apologists say, the BRICS may be able to “alleviate challenges” they face from the “international financial system”. The strategy also happens to be one of the key nodes of the progressively solidified China-Russia alliance, recently featured via the gas “deal of the century” and at the St. Petersburg economic forum. Just as Brazil managed, against plenty of odds, to stage an unforgettable World Cup – the melting of the national team notwithstanding – Vladimir Putin and Xi Xinping now come to the neighborhood to play top class geopolitical ball. The Kremlin views the bilateral relation with Brasilia as highly strategic. Putin not only watched the World Cup final in Rio; apart from Brazilian President Dilma Rousseff, he also met German chancellor Angela Merkel (they discussed Ukraine in detail). Yet arguably the key member of Putin’s traveling party is Elvira Nabiulin, president of Russia’s Central Bank; she is pressing in South America the concept that all negotiations with the BRICS should bypass the US dollar. Putin’s extremely powerful, symbolic meeting with Fidel Castro in Havana, as well as writing off $36 billion in Cuban debt could not have had a more meaningful impact all across Latin America. Compare it with the perennial embargo imposed by a vengeful Empire of Chaos. In South America, Putin is meeting not only with Uruguay’s President Pepe Mujica – discussing, among other items, the construction of a deepwater port – but also with Venezuela’s Nicolas Maduro and Bolivia’s Evo Morales. Xi Jinping is also on tour, visiting, apart from Brazil, Argentina, Cuba and Venezuela. What Beijing is saying (and doing) complements Moscow; Latin America is viewed as highly strategic. That should translate into more Chinese investment and increased South-South integration. This Russia-China commercial/diplomatic offensive fits the concerted push towards a multipolar world – side by side with political/economic South American leaders. Argentina is a sterling example. While Buenos Aires, already mired in recession, fights American vulture funds – the epitome of financial speculation – in New York courthouses, Putin and Xi come offering investment in everything from railways to the energy industry. Russia’s energy industry of course needs investment and technology from private Western multinationals, just as Made in China developed out of Western investment profiting from a cheap workforce. 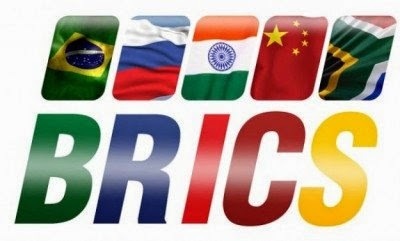 What the BRICS are trying to present to the Global South now is a choice; on one side, financial speculation, vulture funds and the hegemony of the Masters of the Universe; on the other side, productive capitalism – an alternative strategy of capitalist development compared to the Triad (US, EU, Japan). One might view the BRICS’s strategy as a sort of running, constructive critique of capitalism; how to purge the system from perennially financing the US fiscal deficit as well as a global militarization syndrome – related to the Orwellian/Panopticon complex – subordinated to Washington. As Argentine economist Julio Gambina put it, the key question is not being emergent, but independent. In this piece, La Stampa’s Claudio Gallo introduces what could be the defining issue of the times: how neoliberalism – ruling directly or indirectly most of the world – is producing a disastrous anthropological mutation that is plunging us all into global totalitarianism (while everyone swears by their “freedoms”). It’s always instructive to come back to Argentina. Argentina is imprisoned by a chronic foreign debt crisis essentially unleashed by the IMF over 40 years ago – and now perpetuated by vulture funds. The BRICS bank and the reserve pool as an alternative to the IMF and World Bank offer the possibility for dozens of other nations to escape the Argentine plight. Not to mention the possibility that other emerging nations such as Indonesia, Malaysia, Iran and Turkey may soon contribute to both institutions. No wonder the hegemonic Masters of the Universe gang is uneasy in their leather chairs. This Financial Times piece neatly summarizes the view from the City of London – a notorious casino capitalism paradise. These are heady days in South America in more ways than one. Atlanticist hegemony will remain part of the picture, of course, but it’s the BRICS’s strategy that is pointing the way further on down the road. And still the multipolar wheel keeps rolling along.